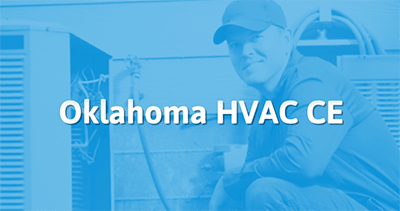 Take the continuing education to renew your OK HVAC license today. All of our courses can be completed At Your Pace Online to help you meet the state's requirements to maintain your license. Once you finish your class you will have an official certificate of completion to save for your records, and we will report your course completion to the state for you. Complete 6 hours of continuing education every 3 years. Obtain, complete, and mail a renewal application to the OK CIB with the appropriate renewal fees and any other required documentation. This online course will meet the Oklahoma continuing education requirements for Mechanical Contractors and Mechanical Journeymen. Our 6 hour course is approved by the OK CIB and includes 6 hours of continuing education on the 2015 International Mechanical Code. We will cover the major changes that were adopted when Oklahoma transitioned from the 2009 IMC to the 2015 IMC.